When the United Nations sends Maine oceanographer Mara Tusconi to Haida Gwaii off British Columbia, she’s thrilled. The archipelago is both a spectacular rainforest and sea kayak destination. But as she untangles a climate change crime, Mara confronts the Haida Nation’s mistrust of outsiders like her, spiteful spirits that aren’t suppose to exist, and a baffling death. Demon Spirit, Devil Sea captures the essence of our changing world as it brings a fascinating culture and ecology into readers’ hearts… The novel opens readers’ eyes to a beautiful, mysterious, and threatened rainforest…D’Avanzo has written an enchanting tale from an ancient corner of the earth. This is a mysterious, fast-paced novel that immerses reader smack dab in the wild. 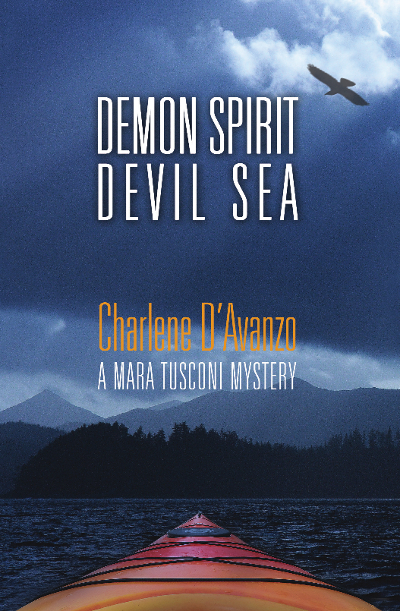 Maine oceanographer Mara Tusconi switches coasts and encounters plenty of peril in Charlene D’Avanzo’s second cli-fi mystery, Demon Spirit, Devil Sea…a compelling page-turner that also provides a fascinating peephole into the world of ocean science and climate change. Marine ecologist and award-winning environmental educator Charlene D’Avanzo studied the New England coast for over thirty years. Her Mara Tusconi Mystery Series takes readers into the stunning beauty of marine waters, including Maine’s coast, and the grave threats facing them. An avid sea kayaker, D’Avanzo lives in Yarmouth, Maine.